Will Carrie Mathison return to the action? Has the Homeland TV show been cancelled or renewed for a seventh season on Showtime? The television vulture is watching all the latest cancellation and renewal news, so this page is the place to track the status of Homeland season seven. Bookmark it, or subscribe for the latest updates. Remember, the television vulture is watching your shows. Are you? 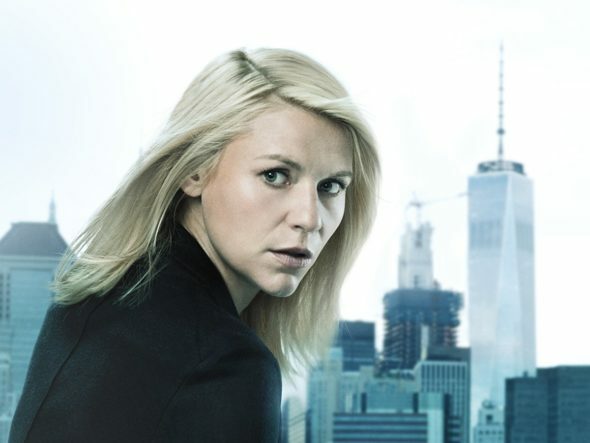 Airing on the Showtime premium cable channel, Homeland follows former CIA officer Carrie Mathison (Claire Danes). Although she’s living with Bipolar Disorder, Carrie was one of the best in her field. Set several months after the end of season five, season six takes place between the US presidential election and inauguration. Now living in Brooklyn, Carrie works for a foundation, helping Muslims who have been mistreated by domestic law enforcement. The Homeland cast also includes Rupert Friend, Elizabeth Marvel, F. Murray Abraham and Mandy Patinkin. Recurring in season six are Sebastian Koch, Maury Sterling, Hill Harper, Patrick Sabongui, Robert Knepper, and Dominic Fumusa. The sixth season of Homeland averaged a 0.42 rating in the 18-49 demographic and 1.28 million viewers. Compared to the season five, that’s down by 17% in the demo and down by 17% in viewers. Find out how Homeland stacks up against the other Showtime TV shows. On August 11, 2016, Homeland was renewed through its seventh and eighth seasons. A season seven start date has yet to be announced. Stay tuned. Although Homeland has already been renewed through season eight on Showtime, its ratings have really fallen off in the current sixth season. Still, it remains one of the channel’s most watched shows. While ratings set the ad rates for commercial television, subscription cable can look to the Nielsens to see what programming their subscribers watch. Although there is no official decision beyond the season eight renewal, EP Alex Ganza has said he and the creative team are writing towards the series’ conclusion. As things now stand, I expect the eighth season of Homeland will be its last. TV show ratings are still important. Follow Homeland’s weekly ups and downs. Check the rankings for all of Showtime’s TV shows. Find more Homeland TV series news or other Showtime TV show news. What do you think? Did Showtime make the right choice in renewing the Homeland TV show through season eight? When should this espionage drama series end? Most entertaning and very relevant. Need maybe 4 or 5 new seasons.